The recent highlights in the Elementary School have focused around the events of our Senegal Arts Week, and culminating World Cultural Month events. I do hope you managed to come in and help us celebrate our diversity, or even help out on a booth. I feel the afternoon's performances also showed our core value of Excellence, in both efforts in preparation and attainment in performance. I would also like to thank those of you who voted in the board elections, we had a higher turnout than before, and we also appreciated those who could come out for the meeting. There was another event that we welcomed some of you to, our Staff Social, which was also most enjoyable. I hope you'll make it to another school evening tomorrow, our International Potluck Dinner (I'm hoping to win Mrs. Clark's birthday present in the tombola :). Finally, please remind your children to give their teachers and TAs a special thank-you (or even a home-made card or cookies!) as next week is Teacher Appreciation Week…. As our beloved Shady Shack begins to incorporate healthier food guidelines, I wanted to address the reasoning behind some of the decisions made, and perhaps use this as an opportunity to provide information to allow for healthier food choices to be made outside of school as well. For those who are unaware, Shady Shack will no longer be selling candy, soda or Tampico juices during the school week and will eliminate french fries from the menu except for “French Fries Fridays.” These items will be replaced by healthier drink/food options including 100% fruit juices with the hope to expand the number of healthy food choices starting this upcoming school year. Just as students need to be taught math and grammar, they also need to be taught how to eat healthy eating skills. These healthy (or unhealthy) eating skills that they develop now as children will be used throughout their lives and can have lasting, serious health consequences. A staggering 72% of men and 64% of women are overweight or obese in America due to an overconsumption of some of the exact foods and beverages we are eliminating from Shady’s menu. In the last 35 years, the number of obese adolescents 12-19 years has jumped from 6% to 18%, and even more unfortunate is that the number of obese children aged 6-11 years has increased from 4% to 20%. Although our student body does not appear to struggle with obesity, good nutrition is still critical because many of the leading causes of morbidity and mortality around the world (particularly in the developed world) such as cardiovascular disease, hypertension, diabetes, and certain cancers are DIRECTLY linked to diet. While we are a diverse, international community, I reference guidelines and statistics from the United States because those stats provide an accurate picture of what overconsumption of added sugars, fats, and sodium can do to a population. The other major food item that is being removed from the daily menu is french fries. Fried foods such as french fries are high in calories and fat (particularly the bad fats – saturated and trans fats) with little or no nutritional value. Saturated and trans fats have been shown to be a major cause of high cholesterol and cardiovascular disease with absolutely no nutritional benefit. In general, calories from fat should provide no more than 20-35% of your total daily calories. Thank you in advance for your attention to this important matter. Please feel free to contact me with any questions. 3. Nurse Information: On the subject of nursing, we are looking for someone to take over Katie's role in the Health Office next year. Please contact the office if you or someone you know would be interested and are qualified for the position. 4. Teacher Appreciation Week: Next week is Teacher Appreciation Week. I know that many students are planning to make a gift, bake a snack, construct a card, or just say a big thank-you to their teachers and Teaching Assistants. We are having a Faculty Appreciation Lunch, organized by the PTO, and I thank those of you who will be helping out. Sharon Nossiter and the PTO team will also be hosting a Staff Appreciation Lunch the following week - we appreciate all the PTO do, too!! 5. After-School Pick-up: Please be aware that students are not permitted to be on campus without an adult after 3:20 pick-up. There have recently been cases of Elementary students waiting for a sibling to play in a soccer match, or a practice. We need to ensure that children are picked up, or if they are watching, they are with an adult. The coaches cannot be held responsible for any accidents. 6. 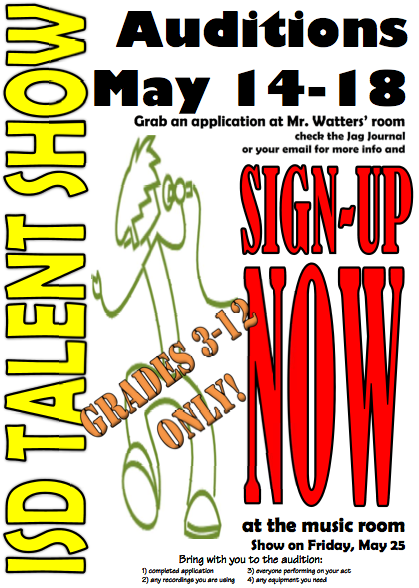 Gr 3-12 Talent Show: The Talent Show sign-up is open for children Gr 3-12, with Mr. Watters running auditions. Students need to be prepared before they meet with him, and he will give advice where needed to polish any acts. The Talent Show will be on May 25, starting at 6:00. 8. DELF Exams: These external French examinations are coming up for many of our ES children on May 16. Ms. Faye will be in touch with timings in the near future. 10. Science Expo News: We had a chance to see the different presentations for the 5th Grade Virtual Science Fair last month. Two of these were selected to go forward into the NESA region Virtual Science Fair. We will find out how these presenters fared soon, but well done to the two groups who now represent the school: Maira de Tollenaere, Davida Alumbaugh, Sophie Kane & Chaney Keck, Ethan Reid, Jordan Dikoum. Also a notable mention for the team of Tyler Osterhout and Kyle Vanelli in the 4th Grade! 11. Spirit Shop: Just a reminder that the ISD items are being spirited away quickly, so get to the Spirit Shop early to secure those summer jaguar T-Shirts and other ISD gifts - open Fridays after school (thanks Grainne)!